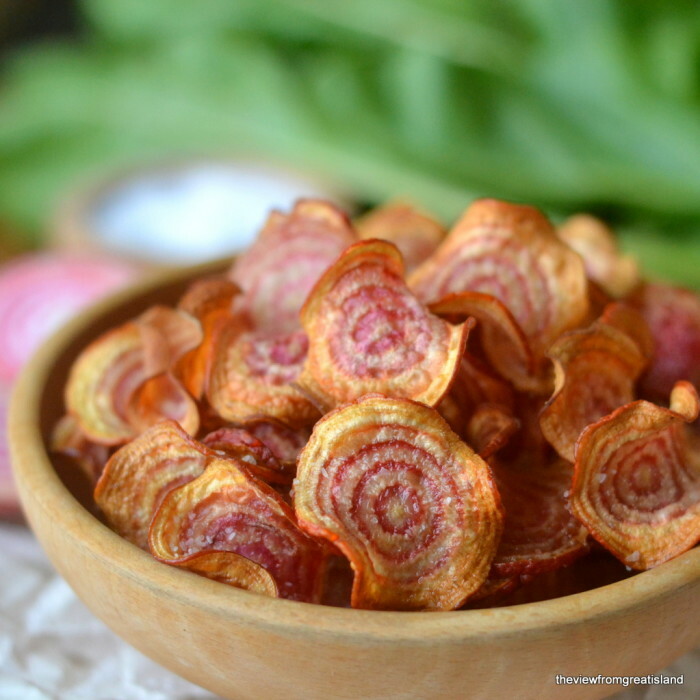 Pink Beet Kettle Chips ~ these pretty pink kettle chips are a novel way to use gorgeous Chioggia beets. Serve them as a crunchy appetizer or side for your favorite burgers! I would have passed right by the beets at the supermarket the other day but a savvy green grocer cut a few of them open and left them out for display. The pink and white spirals hypnotized me. I couldn’t resist turning them into chips. 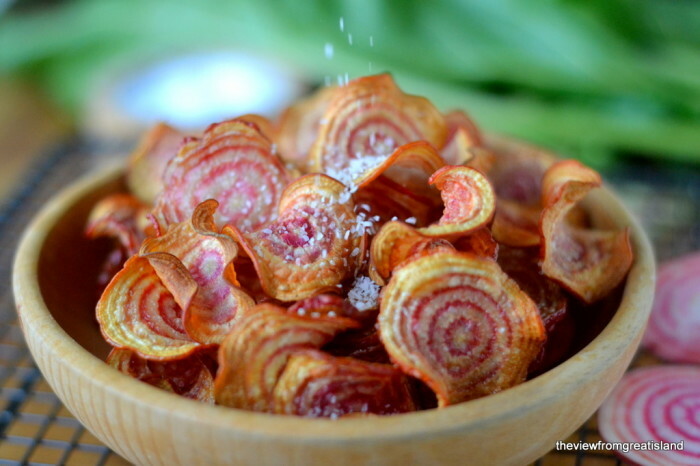 A little hot vegetable oil and a sprinkling of sea salt transforms these pretty spiral slices into a crispy snack. If you use a small pot and fry in batches, you don’t need a ton of oil, a few inches will do. 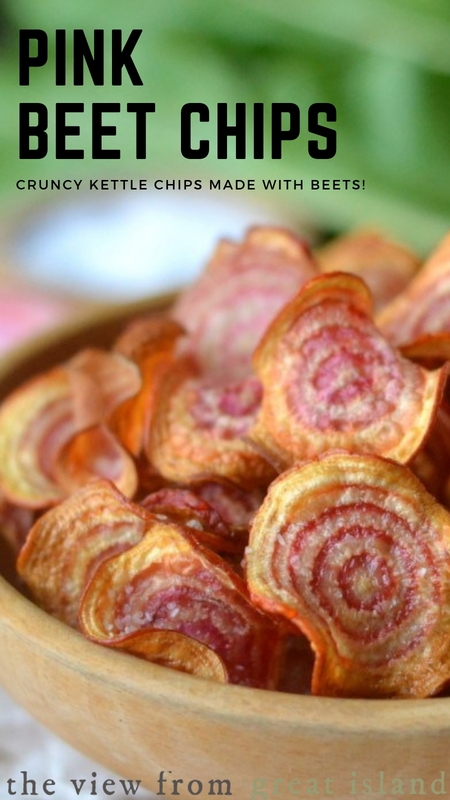 And yes, they do taste like beets, they have a lovely sweet earthy flavor with the same crunch of your favorite kettle chip. Make sure you slice the beets thinly, about 1/8 inch. If they are too thick it will be more difficult to get them crisp. A mandoline slicer is the tool for the job. The oil needs to be hot, 350F is best. If it is too cool, the chips won’t get crisp, and if it is too hot, they will turn a dark brown. Use a clip on thermometer for best results, and don’t fry too many chips at once or the temperature of the oil will drop. 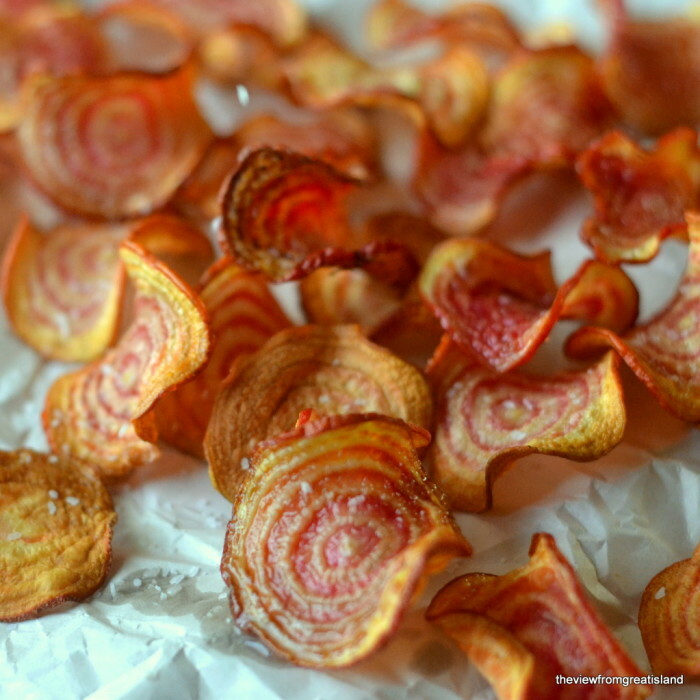 You can use regular red or golden beets to make chips, as well. If you’re interested you can buy the heirloom Chioggia beet seeds online from the Seed Saver’s Exchange, and grow them yourself. 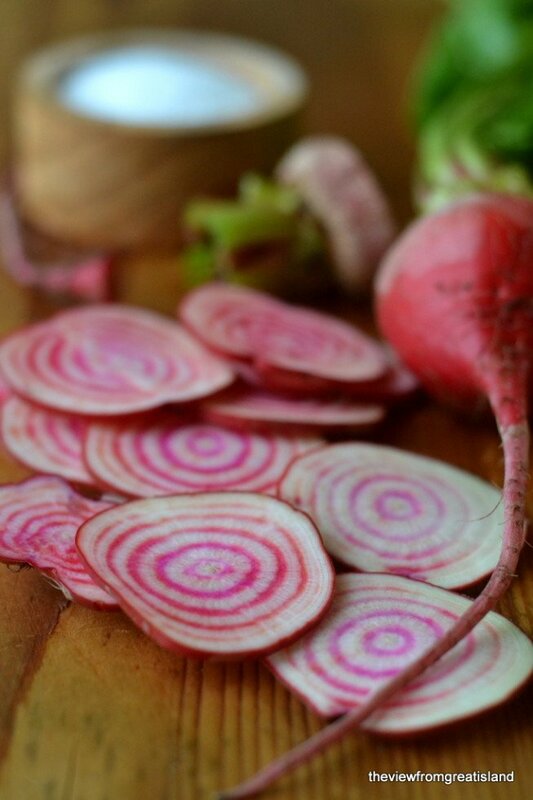 How about this cute way to serve Chioggia beets for Valentine’s Day? 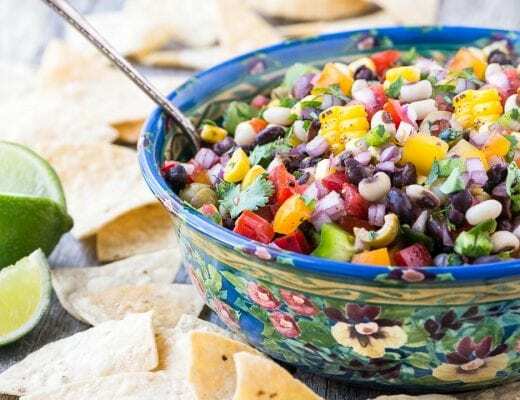 I want one of these so I can make this pretty salad. I love the color of this blush pink Chioggia soup . What are you going to do with your beets? Wash the beets and slice them paper thin, there is no need to peel them. The best way to slice them is with a mandoline slicer, set on the 1/8 inch setting. Pour at least 3 inches of oil into a medium sized heavy pot. Heat the oil to 350F. Fry the beets, in batches, for about 2 minutes, until golden. Flip them around in the oil frequently so they cook evenly. First the slices will float to the top, then they will shrink and start to curl around the edges as they lose their moisture, and finally they will begin to turn golden. Drain them on paper towels and sprinkle with sea salt while they are still hot. These look so cute and they must taste wonderful, too! :} I’ve included it in my Valentine’s Day roundup with a link back here ? I saw these earlier in the week and never got around to commenting until now. They are so beautiful and creative. 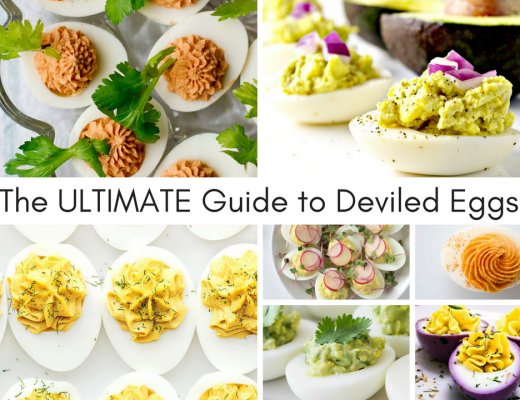 I love your posts and they inspire me to think outside the culinary box. I’ve had the worst week at work – and am hopeful for a fun successful weekend in the kitchen. Have a great one! Thanks Tricia, that boosted my mood. I’ve had a couple of bum days in the kitchen. Sorry about your bad work day, but that’s what weekends are for!! prettiest chips ever, no question. oh my gosh, I’d forgotten about chiogga beets! I roasted some a couple years ago. I imagine that these chips were fantastic!! Those beets are just lovely. Thanks Cheri, these were fun to make, I may even try a baked version one of these days so I can enjoy them more often. Great idea! We don’t have the Chiogga variety around here right now. Have to add to my seed list! These would be fun to grow with little kids. What a great way to get kids to eat beets! Beautiful! I only fried beets once, years ago, in fact I used them in a cauliflower soup in the beginning of my blog… brings me memories. However, I had a horrible time frying them – they went from perfect to ruined in two milliseconds… I think I probably had the oil too high. good luck with moving, hope you won’t be offline too long! Thanks Sally—I know just what you mean, there is a sweet spot when they are done just perfectly, and then they can quickly become overdone. The end result was worth hovering over the oil, though! how pretty! 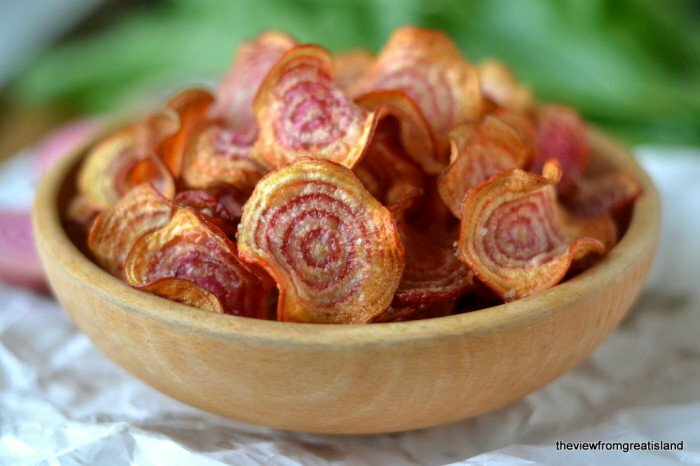 i love the beet chips in the terra mix, what a lucky find! I’m always picking out the beet chips from those bags, I’m addicted. What a great idea for snacking ! Love this idea. 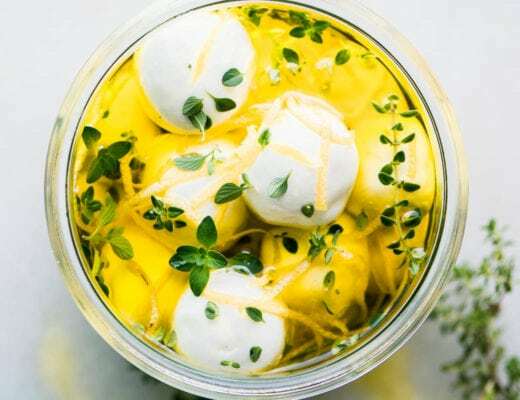 Can we make this with the dark purple beets we find at the supermarket? Otherwise where can we find the pink beets? Thanks in advance. They are just as good and sooo pretty. 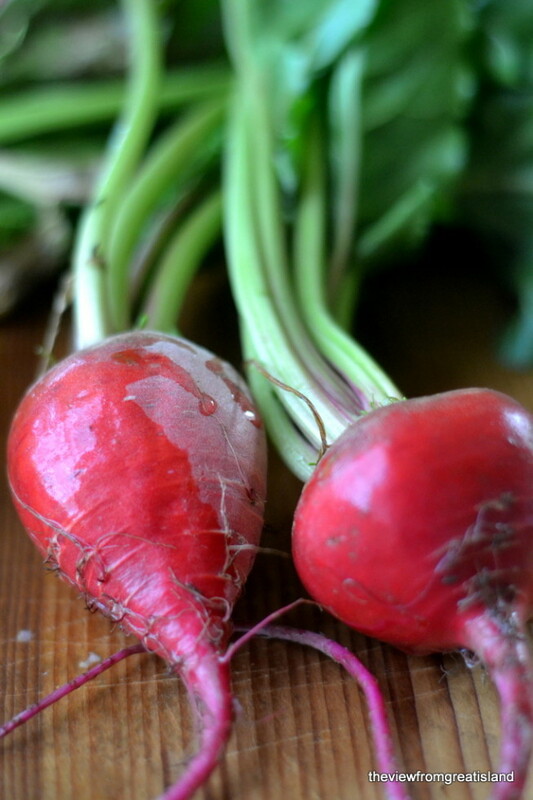 Ask your grocer about the Chioggia variety, you might have them at your local store and not know it because they look the same as regular red beets on the outside.